Occasionally, a car comes on the scene with performance that so dominates the competition that it has to be given a special place in the automotive world. Performance means acceleration, and the chief determinant of thunderous acceleration is the power to weight ratio. 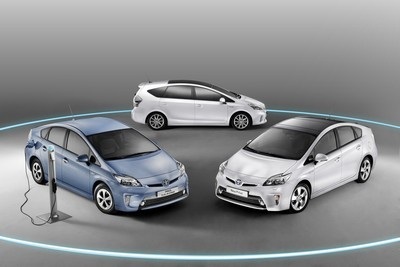 At the high end of the scale, the Toyota Prius slinks in with a ratio of 31 pounds per horsepower or lb/hp. A standard car, like the Audi A3, will deliver 12.9 lb/hp. A muscle car built for acceleration such as the Dodge Charger SRT-8 achieves a ratio of 8.9 lb/hp. 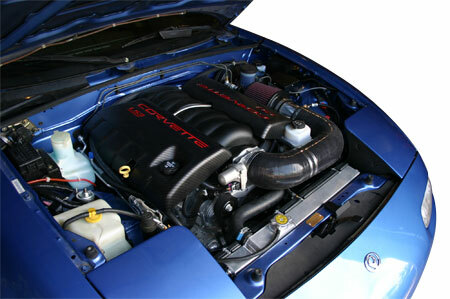 The most powerful Corvette, the ZR1, has a ratio of 6.2 lb/hp. The dominant performer for cars with a list price under $200,000 is the Mazda Miata with a ratio of 5.7 lb/hp. What!? No. Wait. The Mazda Miata? 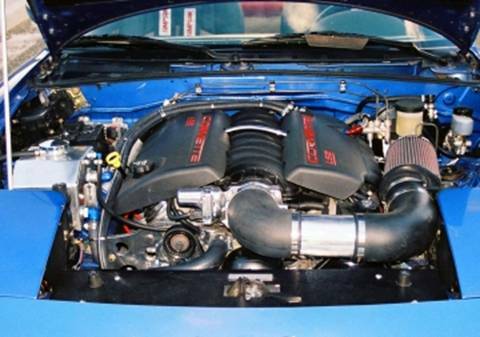 Not that Mazda Miata, not the four cylinder version, the Mazda Miata V8, the 2400 pound, 420 horsepower Miata. Not familiar with that model? That’s because you don’t buy it, you build it. 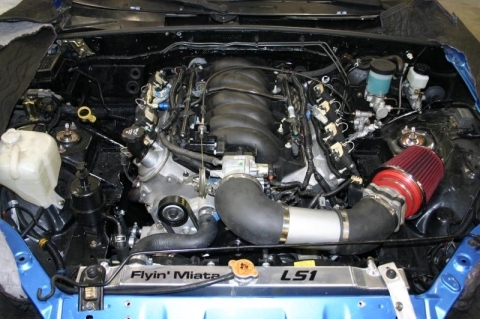 You find a used Miata in good condition and deliver it to one of the companies that install stock Chevy LS3 engines, give them $25,000 dollars and come back when they’re finished. That seem steep? It isn’t. A Chevy Camaro Convertible costs $42,000 base. 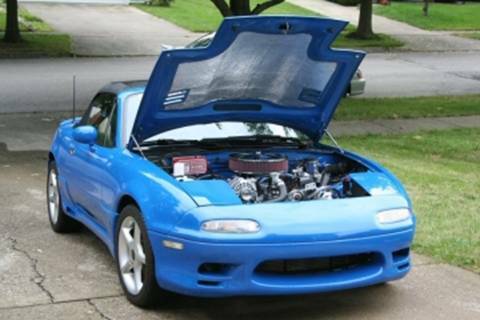 The used Miata will cost around $10,000 for the used car plus $25,000 to convert it to V8 power. That’s $35,000. That’s not a bad price for any performance car, much less a supercar with a power to weight ratio exceeded only by the Bugatti Veyron at 4.2 lb/h and the Saleen S7 Twin Turbo at 3.9 lb/h. The car isn’t nose heavy. The weight distribution is 52%/48%, front and rear. The 6.2 liter Chevy LS3 engine adds just 200 pounds to the weight of the car and one third of that weight is on the rear wheels. This isn’t a job you want to do yourself. It’s simply too extensive. The companies that do the conversion don’t just shoehorn the engine into the front bay. They change the transmission and transmission mounts, the brakes, the differential and differential sub-frame, the driveshaft, the axles, the power steering unit, the frame, the clutch and clutch hydraulics and the headers. All of the parts in the Miata V8 are stock. The engine can remain as it came from the factory and retains the (usually) two year, 24,000 mile warranty. Everything else is simply bolted in and carries the manufacturers warranty. Driving the Miata V8 is delightful. It isn’t balky in traffic, and it doesn’t over-heat. The car is responsive. If you just want to idle along the freeway with traffic, the car does it without complaint. Push the pedal to the floor and the world whirls by in startling fashion. Two things need to be done by the owner of the car or the shop. Fender flares and bigger (much bigger, a lot bigger) tires need to be installed. Done correctly, the fenders look impressive but appropriate and you can mount tires as big as 285/30/18. The car will need bigger anti-sway bars, as well. By the way, the Saleen Twin Turbo S7 was created to compete at Le Mans in it’s racing configuration and costs $585,296. 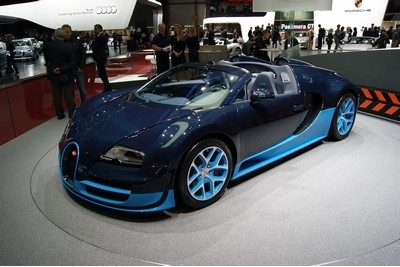 The Bugatti Veyron is a heart-thumping statement by Volkswagen about what a car ought to be when limitless talent, time and money are available. It costs $2.7 million dollars. $35,000 doesn’t seem so bad. If you need more information about used Mazda Miatas and news about cars in general, visit www.carzoos.com.au. Previous page Previous post: Why should I choose Carole Nash for my cherished car?